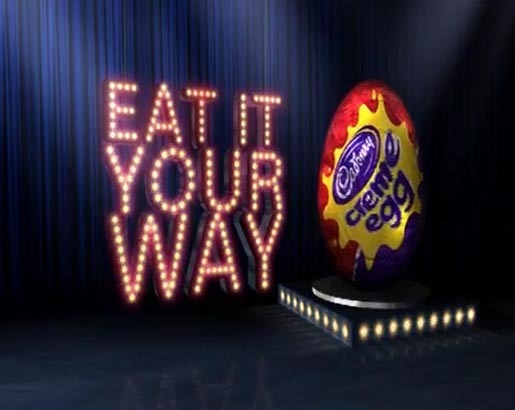 Cadbury UK have promoted their ‘Creme Egg’ in a campaign centred around Easter and ‘My Way’, the song co-written by Paul Anka and Frank Sinatra. “And now, the end is near, and so I face, the final curtain”, sings a yellow jacketed man in a barrel, swirling towards a waterfall. “My friend, I’ll say it clear, I’ll state my case, of which I’m certain”, sing two cleaning ladies in a courthouse. “I’ve lived, a life that’s full”, sings an austronaut looking out an multi-mouthed alien singing, “I’ve traveled each and every highway”. “And more, much more than this, I did it my way”, sings a kilt wearing man as he swings his axe onto a creme egg. Watch closely and you’ll see his female companion covered in snow from the roof. The super: “Eat it your way”. The egg yolk and white spill out to make a map of the British Isles. The ‘My Way’ campaign was developed at advertising agency Publicis London by creatives Alex Bell and Christer Andersson with agency producer, Sara Stebbing. The campaign was designed to build on the phrase, “How do you eat yours?”. Filming was shot by director Garth Jennings via Hammer & Tongs, with producer Nick Goldsmith and editor Dom Leung. Post production was done at Glassworks, London, by TK operator Tareq Kubaisi, Flame artist Jake Montgomery, 3D Op Daniel Jahnel, with producer Tom Phillips. Cadbury UK have developed a series of talent show podcasts, hosted by Kate Thornton, giving people a chance to perform online. See The Inspiration Room for a sample of the print work associated with the Cadbury Creme Eggmeister campaign.